Once, here in Xiangkhouang Province, children grew up barely seeing the sun. People spent years hiding in caves and tunnels. Now Phonsavan is so busy it has traffic lights with digital displays showing how many seconds pedestrians have to cross the street—not that you need cross the street to find a bank, a restaurant, a market full of fresh fruit and vegetables, a shop selling running shoes. Along with the fabled megalithic urns on the Plain of Jars, whose purpose still mystifies archaeologists, the debris of the American air war that lasted from 1964 to 1973 has become part of a public relations campaign to attract tourists: That heap of bomb casings is displayed in front of the local tourism office. 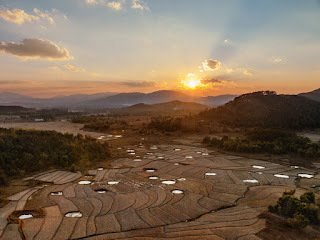 With its undulating hills and grassy flatlands, the Plain of Jars in some places resembles a giant golf course. The sand traps here were made by falling bombs, millions of which exploded. Millions more did not, creating a permanent danger, especially to those entrepreneurial Laotians who make money salvaging valuable metal from unexploded bombs. “Welcome to Mr. Phet Napia Making the Spoon and Bracelet,” announces the ad on Phet Napia’s house in the village of Ban Naphia. In his backyard foundry Phet melts aluminum from ammunition shells and locally collected metals. He then pours it into a mold to create bomb-shaped key rings as well as eating utensils. Local restaurants all seem to have forks, spoons, and chopsticks made of war-era scrap metal.